As some of you have heard, the Canyonville Show is no more. Despite nearly 15 years of hard work building this venue from the ground up, our efforts went down in flames after the 2015 show. My friend, Ed Soliz, was our liaison at Seven Feathers. Ed made it work. Sadly, we lost Ed to Lou Gehrig's disease in the Spring of 2015. With Ed's passing, we lost any and all hopes of continuity. Seven Feathers became increasingly difficult, and ultimately impossible, to deal with after Ed's death. A combination of ongoing broken promises and overwhelming price increases on their part sang the swan song for a show that had become a west coast regional favorite. We provided Seven Feathers with substantial convention center lease income, guaranteed blocked hotel room sales, as well as ancillary income in terms of gambling, entertainment, restaurant and alcohol sales. Sadly, it wasn't enough, and they wanted more... After ongoing attempts to "think of a way to make it happen", I tossed in the towel. Simply, I was beating a dead horse. Sad, because the show not only became a destination weekend for both insulator and bottle collectors, but also provided locals an opportunity to have their "treasures" appraised for free, and auction them off if they elected (free of sellers fees). Canyonville was simply a fun show in a great facility. And I can't thank each and every one of you enough for being an integral part of "C'ville" over the years. Despite our best efforts to find a suitable replacement location, things looked bleak. Sometimes, though, the solution to a problem is right under our noses and it just takes a kick in the pants to see it. Boy, did 7F ever give me one. Out of the blue, I got a phone call from Greg King, owner of "Glory Days Antiques" in Medford. Glory Days is the premier antique mall in Southern Oregon. Greg has helped push the Canyonville Show for years through word of mouth advertising and by handing out flyers to anyone coming through his doors. Greg was negotiating with the Jackson County Expo to produce a highly anticipated regional venue by the name of the Rogue Valley Antique Show. Would I be interested in co-producing the JSABC Antique Bottle and Insulator Show in the same building on the same weekend? My answer was an immediate and resounding YES! Back to our roots! 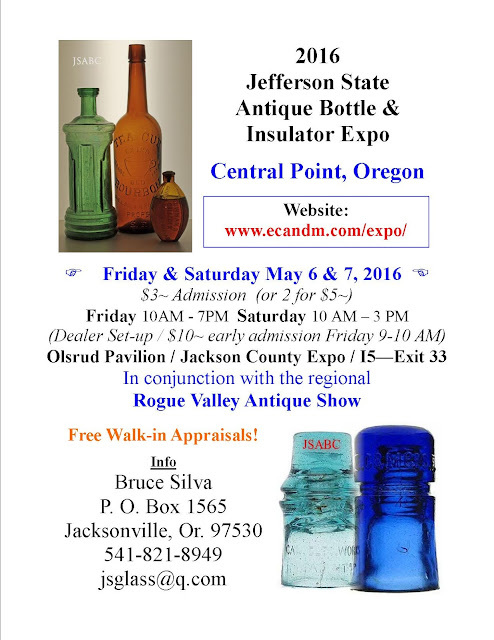 It is with great pleasure that I announce the first annual "Jefferson State Antique Bottle and Insulator Expo" to be held May 6 & 7, 2016 at the Jackson County Expo complex just off of I5 in Central Point, Oregon (only 2 minutes north of Medford). This venue will replace the now defunct Canyonville Show. The contracts have been finalized and we have the table and booth locations drawn up and approved by the Fire Marshall. We are initially starting out this year with slightly more than 50 tables for bottle and insulator dealers, which will occupy roughly half of the nearly 12,000 square foot building. We have reduced the table fees based on overall operating costs. They are $50~ per. This will include one 30" x 8' table plus two chairs. Our loyal past dealers were given the opportunity to reserve their tables until Feb. 29, prior to opening up general reservations. We've had a lot of advance interest and as of yesterday, in the space of just over a week, 30 tables have been spoken for. I can't stress the old saying enough; "you snooze / you lose". Simply, if you are serious about a table / tables, request a dealer packet and mail your reservation in as soon as you receive it. May is a good (no great) month here in So. Oregon. It's almost always warm, but almost never hot. Figure temps in the 70's to 80's. Allergy season is pretty much over. Same goes for snow. Mid spring here is the cats pajamas! You want to tie in some fishing? Trophy lakes are about an hour away and the winter ice will have long since melted; (my favorite is Diamond and I've reeled in some lunkers there). Applegate Lake is another nice day trip. Decent fishing there for cut throat and rainbow trout. Crater Lake is only a couple of hours away too; well worth the drive! Historic Jacksonville is only about 15 minutes from the expo and is also worth a visit. 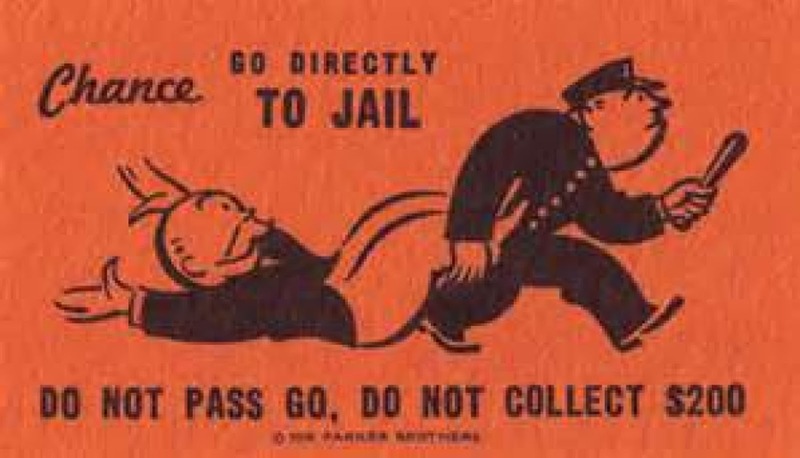 Don't set your sights on digging though - it's a sure fire way to draw a "go directly to jail" card! We will provide a total of roughly 50 tables, with two chairs per table. You will need to make your own arrangements if you need more chairs. The tables are wood. If you want a table covering, please bring your own. At this time, there are no provisions for electrical. In order to make setup as smooth and seamless as possible, the antique dealers will be allowed to construct their booths starting on Thursday. "Glass" dealers will be allowed to bring in their stock on Thursday as well, if you wish. But, nothing will be allowed on the bottle or insulator tables until dealer setup on Friday morning. There will be a charge for general admission. It is nominal and is helping to defray the cost of producing the show. It will be $3~ each or two for $5~. This is well under half what previous antique show venues have charged in the past and will not hinder our admission numbers. Bill, our webmaster, has the splash page up and the website ready to roll out as soon as the last few details are ironed out. Here's a link to it; http://www.ecandm.com/expo/ . Keep an eye on it as we move forward! RV parking is available onsite. Sites are easy to maneuver and include power and water only (no sewer hookup or dump). The Expo handles all details regarding RV spaces. For information contact the Expo at (541) 774-8270. There are numerous doors which will allow easy load in and load out. We will have provisions in place for temporary parking to allow you to off load your cases. The grounds are mostly level and both the parking lot and the pavilion floor are in good repair. You are requested to watch out for horses and other livestock and to keep your speed down to a minimum since a regional livestock event is being held in an adjacent building to ours. Prior to the show, you will receive your table assignment and a color coded map. Your table number will cross reference to the color and your parking lot gate entrance number and load in / load out route will be shown on this map. Once off loaded, you will proceed to dealer parking, which is located outside the pavilion grounds, a short distance away. Signage will also help direct you once you arrive. We are doing everything possible to make this joint venture a smooth transition from C'ville to Expo. We thank you for your continued support, and look forward to making this Fresh Start a fun and enjoyable weekend for all!